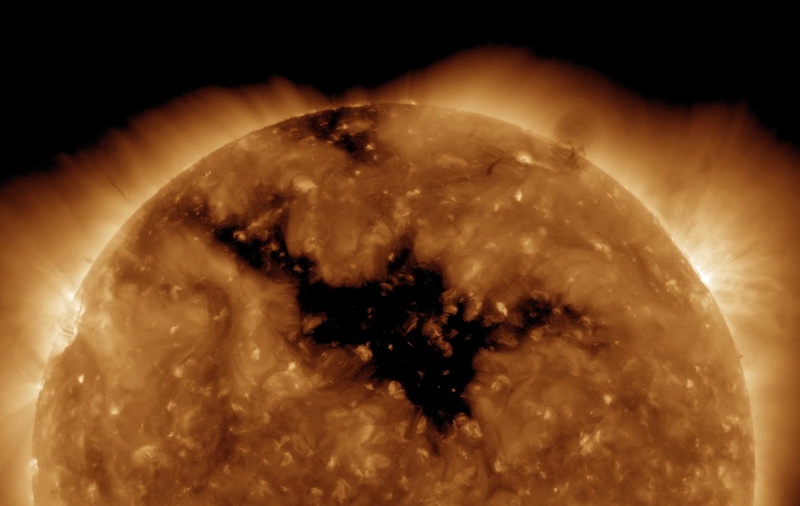 Explanation: This ominous, dark shape sprawling across the face of the Sun is a coronal hole -- a low density region extending above the surface where the solar magnetic field opens freely into interplanetary space. Studied extensively from space since the 1960s in ultraviolet and x-ray light, coronal holes are known to be the source of the high-speed solar wind, atoms and electrons which flow outward along the open magnetic field lines. During periods of low activity, coronal holes typically cover regions just above the Sun's poles. But this extensive coronal hole dominated the Sun's northern hemisphere earlier this week, captured here in extreme ultraviolet light by cameras onboard the Solar Dynamics Observatory. The solar wind streaming from this coronal hole triggered auroral displays on planet Earth.